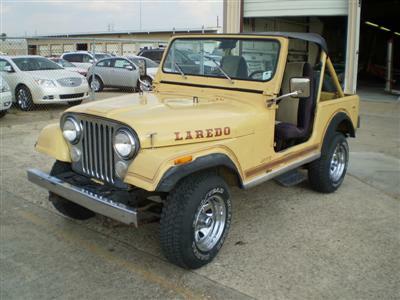 I own an original, unrestored 1981 CJ7 Laredo, 258ci 6cyl. with the original carter carburetor and factory A/C. I use it as a daily driver and flog it like a rented mule every chance I get. I have never gotten it stuck, or rolled it...however I have hit 2 deer, a curb during a snow storm, a couple of small run-ins with trees while off-roading, and crossed numerous creeks and rivers. The odometer just turned over 250,000 miles last weekend, and it runs just as strong as the day it rolled off the assembly line. It was purchased new by my great uncle in Tulsa OK in 1981. My father purchased it from his estate when he died in 1991, and he used it for daily transportation and as a hunting vehicle in rural Kansas until 1999, at which point I took possession of it. I was 16 at the time. I have had the engine to 6000 rpm in a mud pit on more than one occasion and have had no problems. It starts right up and idles very smoothly at 900rpm. Other than routine maintenance and a few items that wore-out after 200k miles (i.e. brake master cyl, pinion seals, u-joints) it has had NO major work done to it. AMC built them like tanks and it keeps coming back for more. Larry's Comment: Sounds like one tough Jeep...and looks great too! Thanks Tyler.